The assembly of proteins to form larger macromolecular structures within cells is linked to ribosomes and thus to their synthesis through the process of translation. This is the result of recent studies by scientists from the University of Würzburg and the Max Planck Institute (MPI) for Biophysical Chemistry in Göttingen. Ribosomes adopt the role of a quality “checkpoint” in this context: They make sure that newly built proteins are directly fed into the production lines of macromolecular complexes. The researchers have published their results in the journals Cell Reports and The EMBO Journal. “Think of it as LEGO bricks at the molecular level: One brick is attached to the next until the product is finished. If only one defective or wrong brick is used, the entire building may be compromised as a result.” Professor Utz Fischer holds the Chair for Biochemistry at the University of Würzburg. For many years, he has been researching how the so-called “macromolecular machines” are assembled inside cells. His research focus is spliceosomes: these large RNA-protein complexes are an essential part of gene expression within cells. Their job is to remove those sections in the messenger RNA that do not contain any protein-encoding information and unite the relevant sections carrying the information. In their latest work, Fischer’s team with colleagues from Göttingen have figured out the entire production sequence of so-called snRNPs, the subunits that make up the spliceosomes – from the synthesis of the single components to their assembly and combination into the functioning machine. They identified a hitherto unexpected player in this process: the ribosome. Ribosomes are the entities where genetic information (in the form of mRNA) is translated into proteins. How these single proteins subsequently assemble to form macromolecular machines had not been fully deciphered until recently. One thing was however certain: The notion that ribosomes release individual proteins into the cell interior where they roam about in search of the matching counterpart could definitely not be true. “The interior of cells is much too crowded for this”, says Ashwin Chari, project group leader at the MPI for Biophysical Chemistry. It would take the proteins far too long to form complexes; they would get stuck forming erroneous structures and aggregate as a result causing severe diseases, such as Alzheimer´s, in the worst case. “Therefore, a mechanism has to exist in living cells, which protects the newly synthesised proteins at the ribosome and only allows them to associate with their correct counterpart,” says Elham Paknia, who experimentally headed-up the entire project. The scientists have been able to prove that this assumption is actually true for the first time. 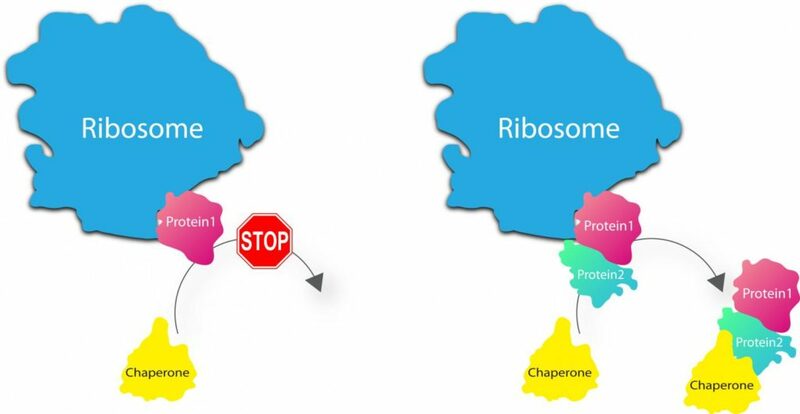 Accordingly, the ribosome does not randomly release the proteins into the cytosol after synthesis, but holds them back until specific helpers, so-called chaperones, deliver the matching counterparts. In doing so, the ribosome assures that only the one intended structure is formed and therefore adopts the role of a „quality inspector” in addition to production. “Extremely high quality criteria” are a basic principle of cellular function according to the scientists. They were able to demonstrate that often more chaperones are involved in assembling the macromolecular machines than building blocks. This also becomes evident when looking at the cell’s energy balance: “The catalysis itself requires much less resources than the regulation and control,” says Utz Fischer. The huge effort is justified: Errors during spliceosome assembly, for instance, trigger spinal muscular atrophy. The disorder is characterised by the loss of motor neurons especially in the spinal cord causing muscle wasting and paralysis of affected individuals. Protein misfolding is also believed to cause various other diseases from diabetes to Alzheimer’s. Even though Fischer and his colleagues in Göttingen have elucidated the ribosome’s role in assembling macromolecules by using the building blocks of the spliceosome as a model system, the researchers are convinced that this is not an isolated case. “We have good reason to believe that this is a general principle”, Chari says. After all, other macromolecules, too, need to be synthesised under the same crowded circumstances while maintaining the highest safety standards.